DEMON OF PARADISE: Recycled Surf & Turf, Filipino-Style – Schlockmania! Anything can inspire a schlock knockoff. Nothing is safe, not even knockoff schlock itself. An interesting illustration of this principle is provided by Demon Of Paradise. 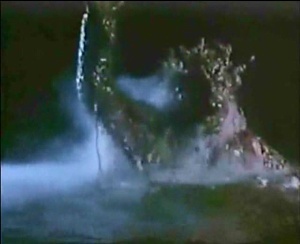 This Philippines-lensed underwater monster flick is essentially an uncredited remake of Up From The Depths. No one considered that Jaws knockoff to be a classic but it made it to theaters. Any idea that makes money once is worth repeating in the world of schlock so Cirio Santiago – the producer of Up From The Depths and a prolific schlock director in his own right – dusted the concept off in the late 1980’s and gave it another go. 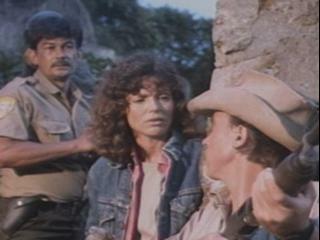 The plot takes place on a Hawaiian island that some smugglers are using as a selling point for dynamite. When they test their merchandise, they unwittingly awaken a creature that represents a missing link between reptiles and humans. It begins bumping off locals, attracting the attention of Sheriff Keefer (William Steis) and marine biologist Annie (Kathryn Witt). As they try to figure out a way to stop this new menace, mercenary local hotel owner Cahill (Laura Banks) tries to capitalize on it to drum up business for her flagging resort with the help of unscrupulous reporter-turned-hotel P.R. man Ike (Frederic Bailey, who also wrote the screen story for this film). 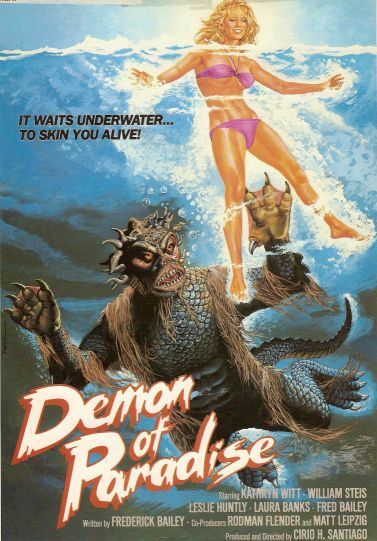 Demon Of Paradise has some key plot elements in common with Up From The Depths – an ancient underwater beast awakened from its slumber with deadly results, a troubled hotel that tries to capitalize on the beast’s reappearance, a subplot with a model visiting the island – but also adds its own wrinkles to the formula. The characters are all different, the plotting is a bit more ambitious and the beast is two-legged instead of a giant fish. To its credit, it has a better pace and more action than its threadbare model. That said, Demon Of Paradise still falls short of schlock-classic status. The writing is rough, the main problem being that the decent main heroes are offset with a number of one-note supporting characters. The performances are also weak: decent lead turns from Steis and Witt are diluted by a shrill turn from Banks and an annoying “comedic” performance from Bailey that will have you cheering on the monster to pull him under the waves. The monster is also kind of silly-looking, a trait that is accentuated by the way he waves his claws at a person he is about to attack. However, the biggest problem with Demon Of Paradise is that it’s not scary. Santiago was better known for action fare like Savage and T.N.T. Jackson and horror fare doesn’t really seem to suit his abilities: despite the occasional nod towards horror visuals like backlighting the monster and using fog, he never really achieves the atmosphere the film needs. He directs it like an action film that happens to feature a monster for its main villain and this really undercuts the film’s appeal. Thus, Demon Of Paradise is minor stuff in the world of sea-schlock. It’s better than Up From The Depths – but that’s not really saying much.